Today is a big day at Chartiers as we recognize our staff and celebrate 50 years of service for Chartiers Center. 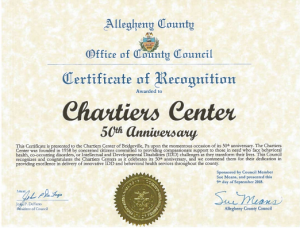 Helping us celebrate our milestone is Representative Dan Miller who sent us a warm letter of congratulations and Sue Means, Allegheny County Office of County Council who presented Chartiers with a Certificate of Recognition. 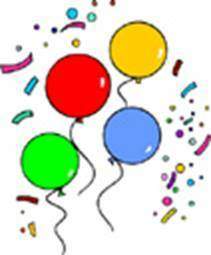 Today we combine our extra special Employee Appreciation celebration with Chartiers Centers birthday party! We have had fun with the 50 days of raffle prizes and of course Katherine’s poems announcing the winners. We have celebrated by guessing the number of purple and green M&M’s in a jar. 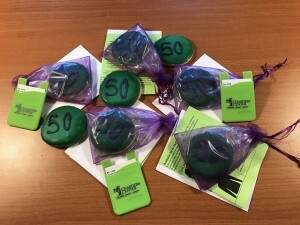 And with today’s GRAND FINALE all employees were recognized with a special “50th” cookie and a gift of appreciation.